Interested in installing vinyl fencing? Smart idea! Below you’ll find out why vinyl fences are the most common type of fencing as well as ways that you can maintain/care for them. Why vinyl fences are the most popular types of fence. Compared to all the fencing products on the market, vinyl fencing is one of the cheapest. Why? It’s made from a special type of PVC plastic. In fact, it’s often referred to as PVC fencing. Yes, vinyl fences are made from the same type of material that PVC pipes are made from. This type of plastic is amazing at withstanding weather, hard hits from debris, and even animals. Installation for vinyl fencing is much different than installing chain link, aluminum, or wood fences. This is why you want to be very sure you have a fencing contractor that has the right skills and experience. The entire procedure (from design to installation) takes precise calculation to make sure that the fence accents your home or business perfectly. 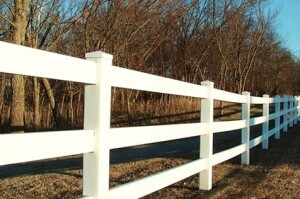 Maintaining your new vinyl fence. So you’ve got your fence installed – congrats! How does it look? Amazing, I’m sure. Although PVC/vinyl fencing is virtually maintenance free, we suggest that you take a bit of time every few months to clean and check your fence so that it lasts you a lifetime. Check your fence for cracks. If your fence has any damage whatsoever, call your fencing contractor so they can repair it right away! Damage, especially cracks, can spread over time (which can, if left untreated, ruin your fence). Check for any holes left by animals. 99% of the time, animals cannot get into vinyl fences. However, some little guys find out ways to make your fence their new home. Make sure to have this fixed right away, as to not compromise the integrity of your fence. Power washing your fence can be an easy way to remove mold and mildew if a jif! We suggest you invest in a good power washer for your new fence.